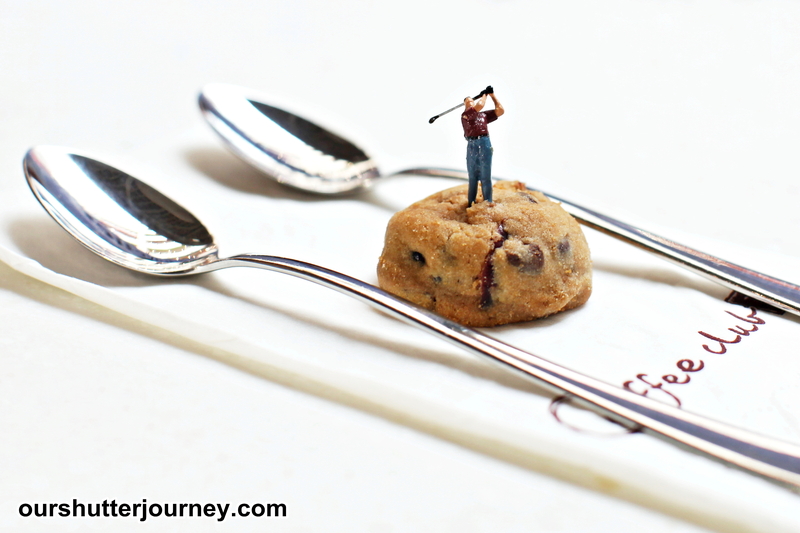 Photo: John had decided to putt from a Chocolate Chip Cookie. 07th November 2014, Singapore – The 1/87 Photography trend was suddenly revived recently and I personally know of a few photographers within my circle who also started to dabble with this. 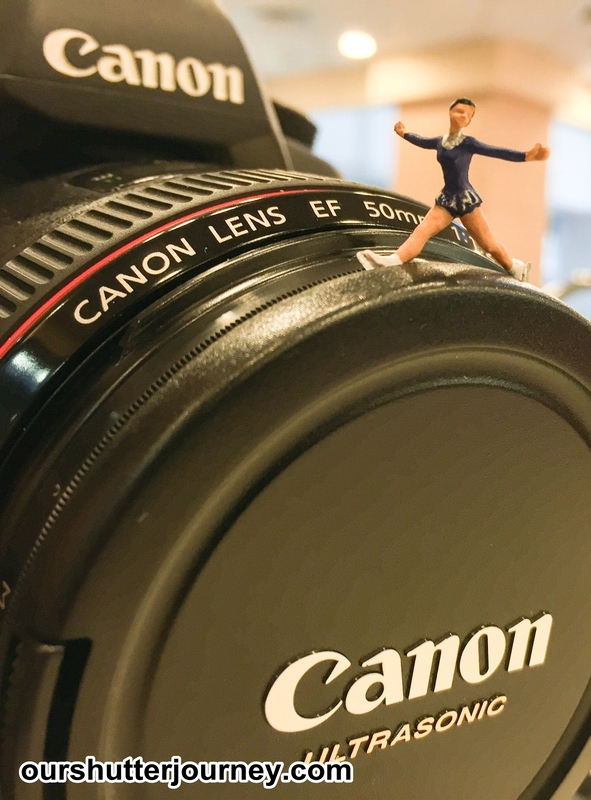 After my recent article on 1/87, I had received all kinds of queries pertaining to this interesting photography genre which is a mix of macro, toy art & portraitures. From asking me about where to buy to how to shoot, I had decided to compile this list of shooting tips for those who are trying out for the first time or those looking to start this. So here I am, presenting to you the 10 Shooting Tips for 1/87 Photography! 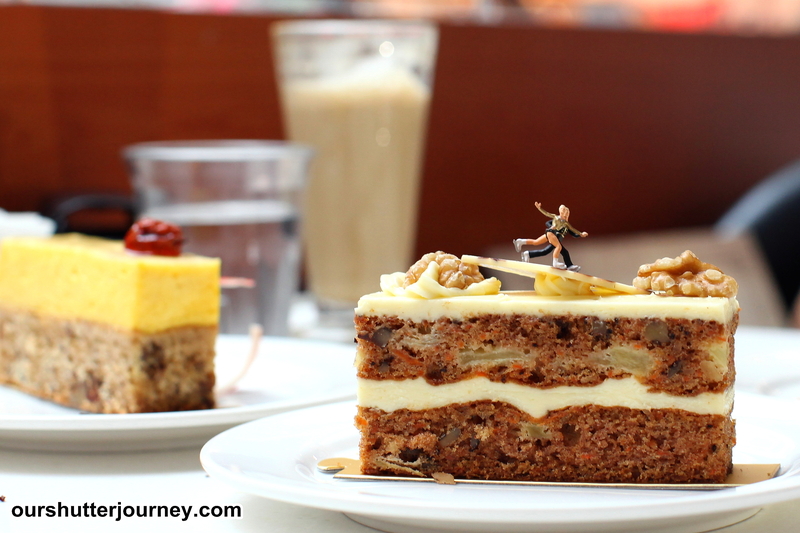 Photo: Doing Carpentry Works on a Carrot Cake. Photo: Joggers Jogging on BlackForest Trail. My personal recommendation will be to purchase those figurines that are “engaged” in an activity like golfers, workers, painters etc, so that you will have more versatility when it comes to shooting options. You may also wish to consider those that are “sitting” too. Photo: Plastic Forceps from First Aid Box, SGD $0.55 (Guardian Pharmacy). Due to the tiny size and sometimes “weak” paintwork on the figurines, I will advise against using hands to handle these figures. Instead, try to get a clinical forceps or a light pressure tweezer to handle the figures. Just imagine you are handling precision tools and you will understand what I mean. You will also find that when you are doing the posing, the forceps are very helpful too. For storage wise, I will suggest not to “overcrowd” your 1/87 figures as it makes searching difficult and there will be an increased risk of paintwork lost. Try to group the figures together in your own preference but keep the group small. 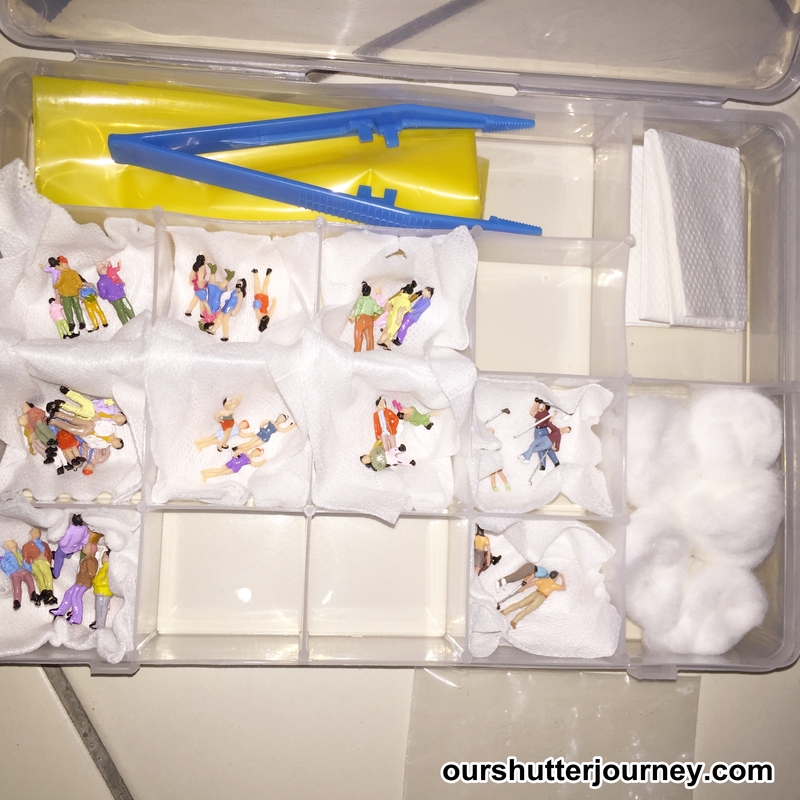 I use a plastic box with dividers to organize my figurines so that it will be really easy to find the figure I want to shoot. Many of these figures are unable to “stand” on its own. Some manufacturers actually recommended their own brand of glue to help the figure stand. I will recommend the Scotch Clear Mounting Tape. All you need to do is to use a sharp scissor and cut a little dot off the tape reel and use for your figures. And a roll of this clear gel-like tape will last for a really long time. Photo: I used this 50mm lens to shoot my 1/87 images. For this article’s photos, I used a 50mm lens (with some taken with an iPhone). While many may argue that a Macro Lens should do a better job but I beg to differ. Reason being the 1/87 figures does not have facial expressions painted properly due to its sheer size and macro lens will give you too much details to the point that the photo is no longer interesting as viewer will be looking at the detailed figurine instead of your overall composition. A regular prime lens like the 50mm will be a much more suitable lens. Those who are using a crop sensor body, you may wish to consider using 35mm or 50mm, for full frame sensor users you may wish to consider 50mm or 85mm as your lens choice. Photo: A mix of handphone torch light and natural sunlight from the sky window inside the mall. I will recommend the use of natural light, ambient light, torchlight or a dedicated macro flash (not a regular speedlite or even the built-in pop up flash). Due to the size of the figurines, a regular flash or built-in flash will make the photo to be very harsh and you will not be able to get anything decent out of it. Try to use a higher ISO if the environment is not sufficiently lighted since most cameras of today can handle higher ISO. Your phone’s torch will be a great help too. 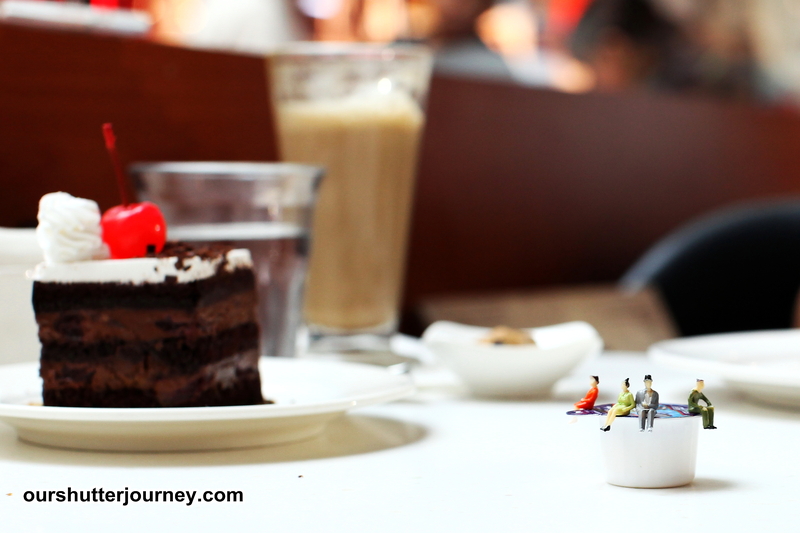 Photo: Ice Skaters having a great time on my cake. Take note that I had framed other table top items into the photo to create that “1/87” factor. This is a tricky one. Many photographers tried shooting this and make the image to be a 1/87 world-realistic photo which is NOT what 1/87 photography is about. Unless you are an expressionists who will rebuilt a full scale 1/87 town complete with buildings and vehicles etc, otherwise you will want your 1/87 to be interesting. I will recommend looking for a familiar scene that has small little things like your office table with stationeries, kitchen top with kitchen wares, or even at a dinning table with food! (which was what I did here). The fun part of 1/87 photography is the “Irony Factor”, that has 1/87 people doing their things in our world, with our stuff of course. 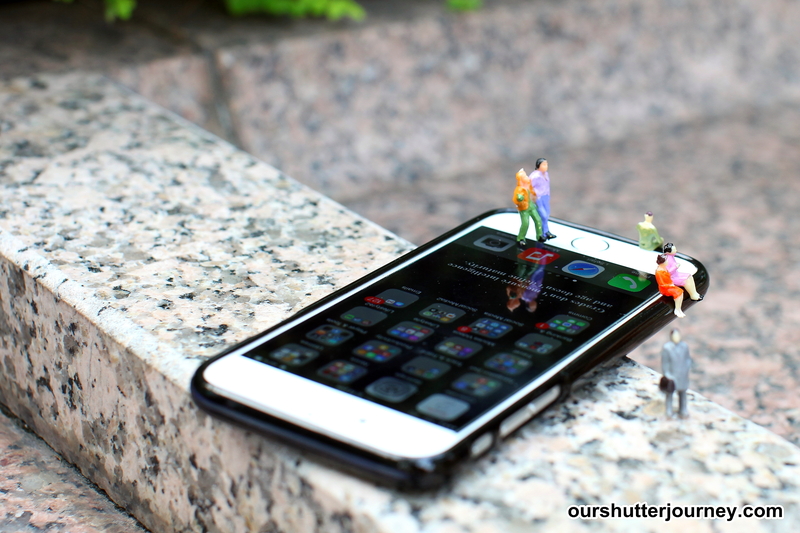 Photo: Use of my phone to show the size comparisons and to create an interesting 1/87 scene. Since I mentioned using Prime Lens as the preferred choice of optics, please do not engage yourself in a bokeh dreamland. 1/87 demand the clarity of the surrounding scene to make the image interesting and the ability to create a one-look story-line. Opening up your apertures to F1.2, F1.4, F1.8, F2 & F2.8 is not what you want to do. When the DOF is so shallow, no one can make out where you posed the figures and that totally defict the purpose of shooting 1/87. I did most of my photos here between F4 to F7.1. 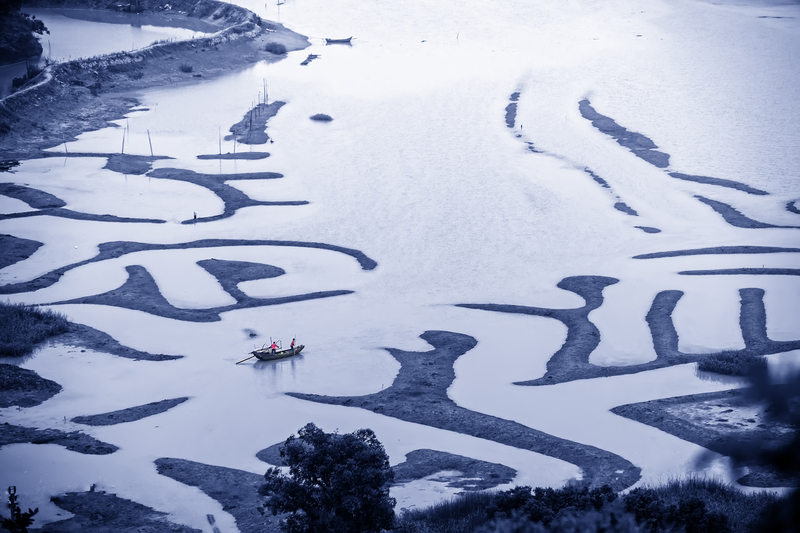 Photo: Do not do tight cropping unless the subject (secondary) is able to fill up the frame and viewer can still make out what is it. Cropping is the main editing trick here for 1/87 photography. Similar to macro, you crop what you need – however with a little twist. You need to include the surrounding scene with emphasis on the 2nd subject or the 3rd subject to make your photo interesting. Otherwise might as well call it “Portrait-for-your-1/87-friend” right? Try not to overdo (saturation) your colors too – remember, you want the Irony Factor so the everyday items that you included in your frame must still look natural and in their real color. Tight cropping is not recommended, unless your 1/87 is posed on an object that is not too big to start with. 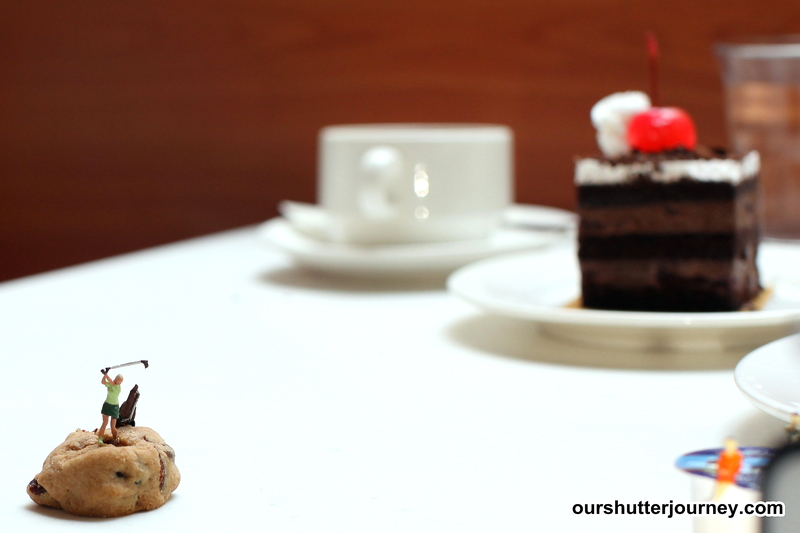 In my example here, cookies and cakes. 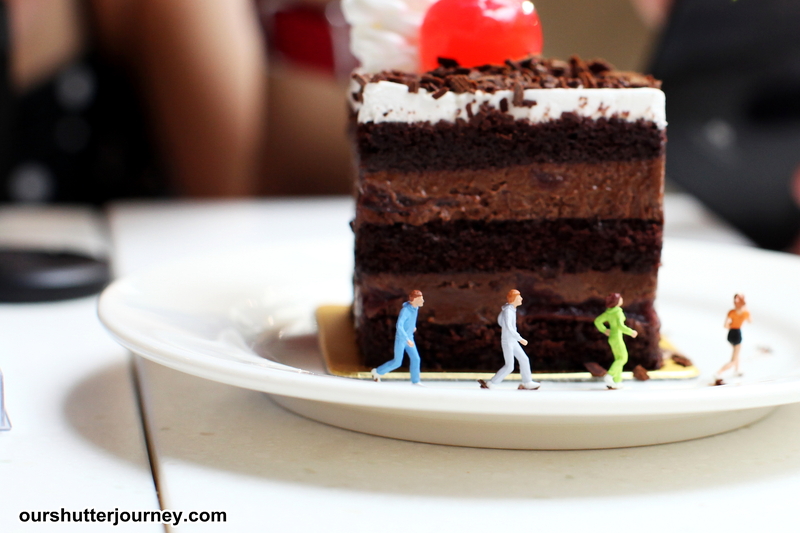 Photo: Susan decided to putt to the last hole on the blackforest cake. This is probably the most redundant tip in this article as all of you already know that most photography work requires your individual creativity to create interesting and unique images. I am including this tip here as a reminder for all of you to be creative. The tiny 1/87 size further demands you to think out of the box and even force you to envision a scene before you even start posing the figures. I am including this tip here also because I only have 9 Tips and “10 Tips” sounds better. 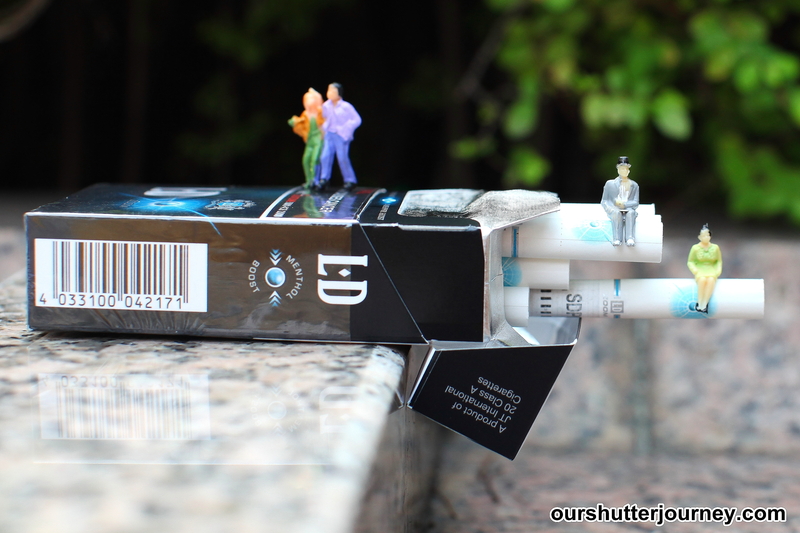 This entry was posted in Photography Articles & Videos, Uncategorized and tagged 1/87, Miniature People, miniature photography, Toy Art, Toy Photography, ToyExpressions. Bookmark the permalink.